Nka: Journal of Contemporary African Art is a biannual academic journal the seeks to remedy the dearth of discussion on African and African diaspora art in contemporary art discourse. It is edited by Salah M. Hassan, a professor of African and African diaspora art history at Cornell University; Chika Okeke-Agulu, a professor of art and archaeology at Princeton; and Okwui Enwezor, director or Haus der Kunst in Munich who sadly passsed away last week, far too young. The most recent issue of the journal is focused on the theme of “Global Black Consciousness” and features pieces on Édouard Glissant, Négritude, and decolonizing Marxism. The introduction to the issue, penned by Salah M. Hassan and guest editor Margo Natalie Crawford, reflects on the meaning of global black consciousness today and details the contents of the issue, which was based on a conference held in Dakar, Senegal. Check out an excerpt from the introduction below, or read the full text by going here and clicking on the PDF link. In conceiving the conference, we were motivated by the need to recuperate and critically engage histories of global black solidarities and their implications for our time. This becomes even more urgent as we continue to witness the return of colonial violence in the form of neoliberal policies that kill, starve, and subjugate men, women, and children of color in Africa, Asia, Latin America, Palestine, and across the Muslim world. Yet, these crises have also resulted in the rise of new resistance movements such as Black Lives Matter in the United States, paralleling antiglobalization, antiracist, and environmental platforms worldwide, which necessitate a new type of politics of solidarity capable of addressing these new challenges. In the context of the United States, the mass incarceration of black bodies reaffirms our conviction of the need to challenge the presumption of a valuefree corporeal schema in a racialized world in which “whiteness” continues to be naturalized. Overall, we certainly hope readers will see the practice of global black consciousness as unfinished work, as the horizon that this volume can only anticipate. 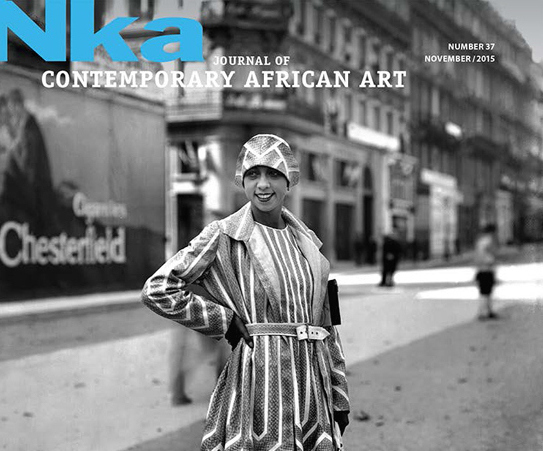 Image: The November 2015 issue of Nka: Journal of Contemporary African Art, a special issue on black fashion. Via afrosartorialism.net.